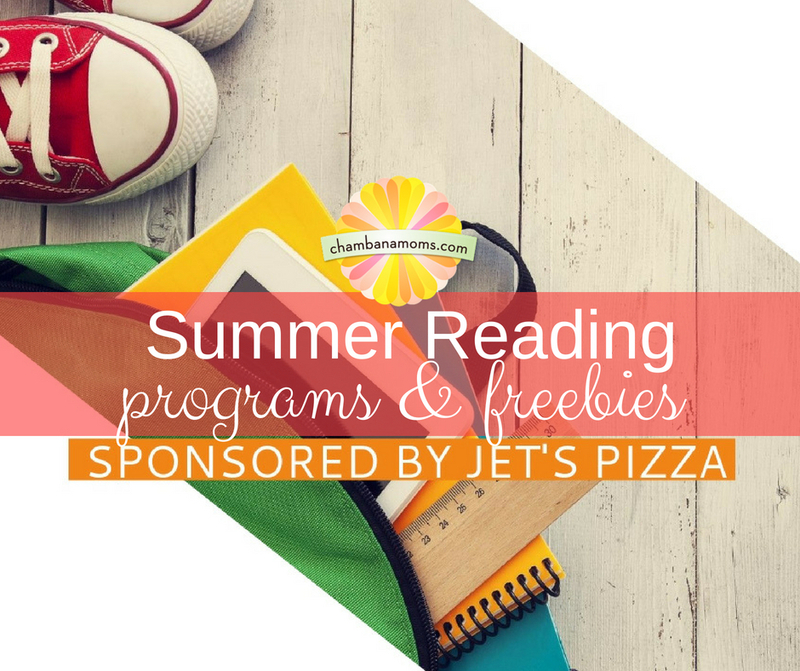 Keep your kids’ minds in motion during the hotter months with some great Champaign-Urbana area summer reading programs. We put together a round-up of as many of them as we could find, and please, if we’ve forgotten one, let us know in the comments. Thanks to Jet’s Pizza for sponsoring this guide. Summer reading has no age limit. There are programs for kids of all ages, as well as grown-ups. In fact, what a great way to model to your children the importance of reading! To get started, register here. Then get a reading log at the library or click here to print your log at home and start right away! (Be sure to register first, so we know you’re participating.) Fill in one square of your reading log for every 10 minutes you read or listen to books. Read 100 minutes to earn a small prize. Keep reading as much as you want to. When you finish (by August 19), you can choose a prize book, thanks to support from the Library Friends. And you’ll be entered to win one of the grand prizes! Earn a prize every time you read for 2 hours! Earn a raffle entry for each 2 additional hours you read. Visit the library to claim your prizes. Read 20 hours or more? You’ll get fame, fortune, and your own free backpack! Grand prize? You can win a Fire HD 8 tablet! Why should kids have all the fun? You’ll receive a coupon for a free book from the FriendShop Bookstore when you sign up. Each week your name will be entered to win fabulous prizes. For children birth through those entering grade 6 – both readers and listeners. Each time you read at least 15 minutes, mark your reading log. Bring your completed log to the Library to receive a free book plus coupons for local businesses. For each additional log you complete, you will receive another free book! For teens who have completed grades 6 through 12. Select books of your choice and keep track of the number of pages read. Every time you read 1,000 pages, come to the Library to pick out a free book from our selection of new books. Reading also enters you in a weekly raffle to win a complete book series. For adults who love to read. Why let kids have all the fun? Read books of your choice and record your reading progress. After you read 4 books, stop by the Library to select a free book from our selection of popular books. Keep reading! For each additional four books you complete, you will receive another free book! Each person completing the Summer Reading Program will receive an entry to win one of three Kindle eReaders. Register here from May 29 to June 30 to be an Allerton Public Library Summer Reader. Readers need to be 3 years old by June 1 and can be entering grade 12. Start logging your reading minutes on June 1 and end July 27. Prizes are available at the library from June 11 through Aug. 3 for reading levels completed on logs. Reading Takes You Everywhere! Join us for a fun party June 9 from 11 a.m.-noon with entertainment by Mr. Steve and sign up to participate in the 2018 Summer Reading Program at TPL. Kids who sign up will be entered for a chance to participate in a balloon animal workshop immediately following the show and will also be entered to win a cool prize! Summer Read Kickoff, Reading Takes You Everywhere!, will be held May 30 from 10 a.m. to noon. Signups began earlier in May. The program begins May 30. Just come into the library and sign up. Come in and sign up for the 2017 Summer Reading Program! The Adult Summer Reading Program is a summer reading program for Adults. It runs concurrently with the Children’s summer reading program. The Summer Reading Program runs 6 weeks in June and July for kindergarten through fifth grade. Stop by the library to find out more information. Children, teens, and adults are all invited to participate in the Mahomet Public Library’s Independent Summer Reading program, which runs May 25-Aug. 16 with special events, storytimes, prizes and drawings. Registration is underway. Each participant is invited to fill out a bingo sheet of reading activities. Every bingo you complete will earn you a bead for your brag tag and a raffle ticket for the end-of-summer prize drawings. Each time you earn a raffle ticket, put it in one of the bins for a chance to win a Magna-Tiles set, a Kindle or a Barnes and Noble gift card. Did we miss a summer reading program? Please add your favorite in the comments!